Let’s prepare for spring days choosing new pieces of clothes, accessories and shoes and creating stylish and cool outfits with them. And today I offer you to pay an attention to vests with a belt. 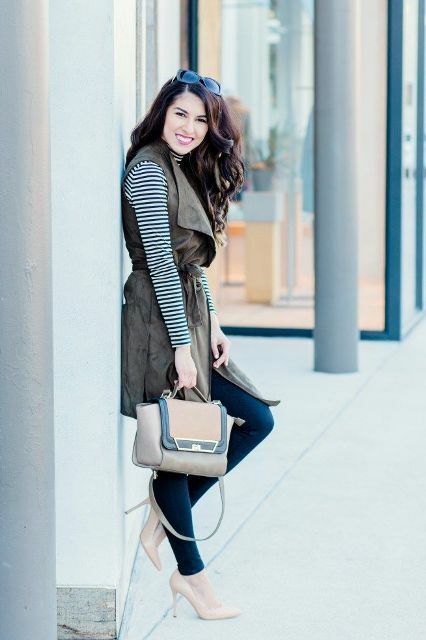 There are many gorgeous vests so I’m sure you will find a perfect item for your spring looks. 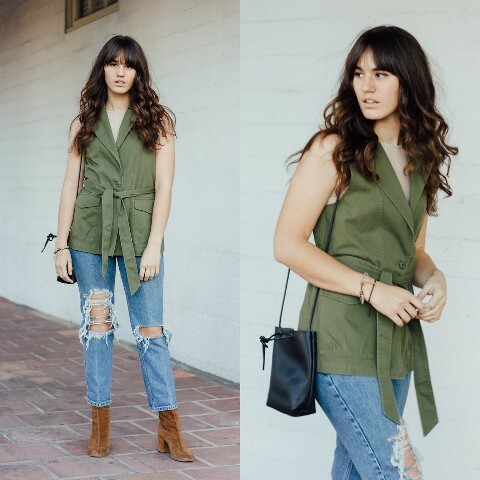 For example, to make a casual outfit you can take a waterfall belted vest and mix it with distressed jeans. Or if you want to create a elegant or cocktail party look you can pair a long straight vest with a belt and a printed dress. So now scroll down and get inspired! Are you looking for casual look ideas? 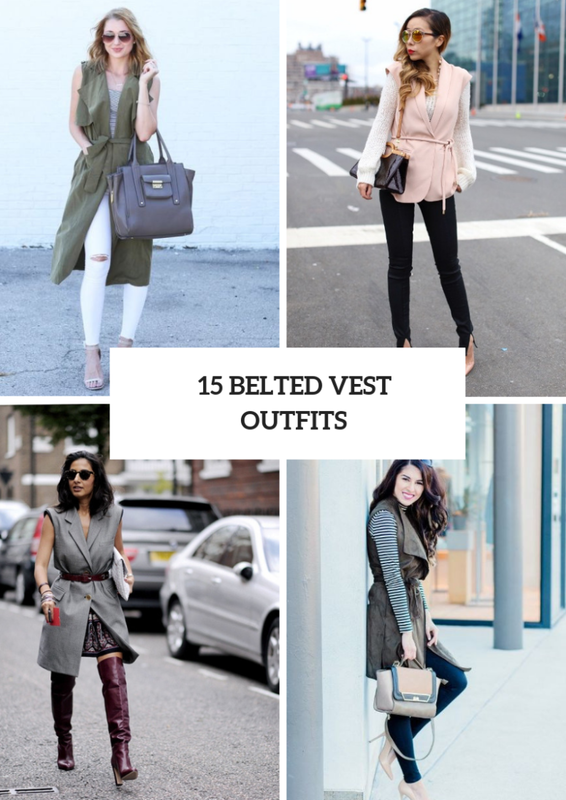 Then you can try to repeat a combination with a white shirt, a light blue long belted vest, a beige crossbody bag, sunglasses, black crop wide leg trousers and flat shoes. 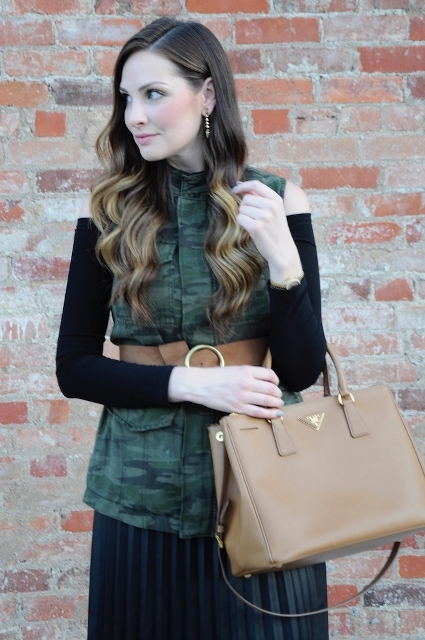 Or you can take a light gray top and mix it with an olive green vest, distressed jeans, brown suede mid calf boots and a black leather small bag. To create a more elegant look you can choose a white sweater and pair it with a pale pink belted vest, oversized sunglasses, a brown and black bag, beige pumps and black skinny trousers. If you love a minimalistic style, then you will like the next idea! Just take a light gray mini dress and combine it with a beige long vest, a beige leather belt, a clutch and black leather cutout ankle boots. Or choose a white loose blouse and mix it with a black leather vest with a wide belt, white and black striped heeled shoes and a black straight mini skirt. Wanna something eye-catching? 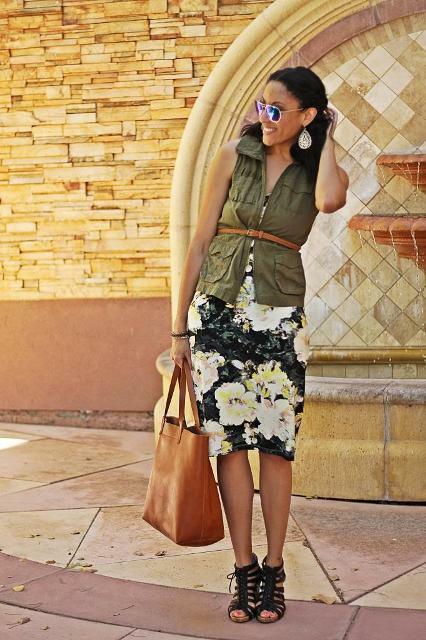 Then pair a floral knee-length dress with an olive green belted vest, a brown tote and black shoes.